All regime change fundamentally means property transfer and land re-distribution, often by force, sometimes by newly enacted laws. This has occurred many times in the past 400 years in Taiwan. Danshui is certainly no exception. Unfortunately, this was also why the once-thriving British shipping establishment disappeared - under the weight of the new laws, and with it, the start of the decline of Danshui's status as the most prominent international seaport of Taiwan. In the beginning, "龍目井,烽火街 and 砲台埔" together constituted an area that covered the present-day Shan-min Street三民街 all the way to Fort Santo Domingo紅毛城. In the Qing era, in the 龍目井 district, there were two wells that provided water for local residents, hence the name. During the Japanese colonial period, this was where the elementary school teachers and their families lived, in single-story Japanese style houses built by 中野金太郎Nakano Kintaro who acquired the land from the 學租財團 in 1912 which in turn obtained the property rights from its previous owner 太古洋行 [the Douglas Shipping Co]. After the Japanese takeover of Taiwan and starting in 1907, the Colonial Gov't, through executive orders and legislation, began to shut down the sea routes of the Douglas. 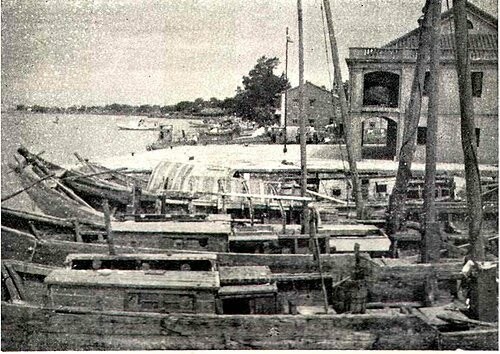 In 1909, that from Danshui to Amoy and Foochow ceased to operate. 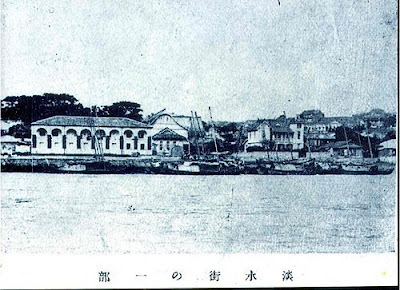 In 1910, the Danshui <-> Hongkong route was restricted and the port of entry/exit was moved from Danshui to Keelung. This was followed by subsidizing the operation of the Osaka Shipping Co for international transports as well as the 伊萬里 I-man-li Shipping Co for inter-port shipping in Taiwan itself. Soon after, the Douglas went out of business with its warehouses and horse stalls taken over by Danshui Postal and Police Offices, respectively. And the company living quarters at 龍目井 given to Japanese businessman 中野金太郎. As mentioned above, 中野 re-built the residences to accommodate teachers from Japan who taught at Danshui and Wen-hua elementary schools. It should be noted that during the Japanese colonial rule, private properties and lands that belonged to Danshui-ren were left untouched. Unjust land reforms came much later in 1953 when small land owners were forced to give up their properties, compensated with worthless stocks of nationally-owned businesses. The beneficiaries were the then tenant farmers, now the landlords of numerous hi-rises dotting the shorelines of Danshui River and beyond. This land reform has not foreseen/stipulated what happens if the farmers no longer till the land and sell it instead. Often unnoticed but this was the biggest wealth transfer in Taiwan history. 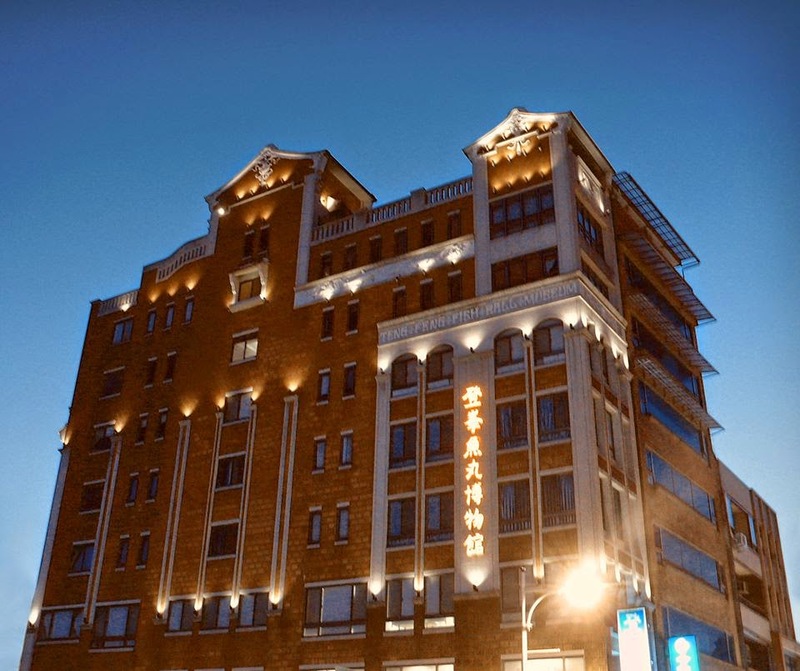 On a personal note: The clinic of Eyedoc's father, a noted surgeon, was located on a small lot on the outskirts of 龍目井, at No 29 - re-named 264 Chung Cheng Road after 1945. 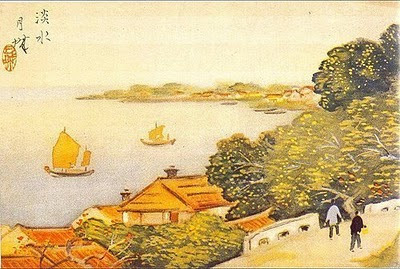 The postcard above is from 森 月城の《台灣的風景繪葉書》；「滾滾長江東逝水、浪花淘盡英雄，是非成敗轉頭空、青山依舊在、幾度夕陽紅；白髮漁樵江渚上、慣看秋月春風，一壼濁酒喜相逢、古今多少事、都付笑談中」。 It is a view from the front yard of the 淡水公會堂 looking north [the unseen Guan-yin Mountain is on the left bank of Danshui River], painted by Mr 森月城Mori Ge'Juo (1887-1961) in the mid-1930s. The cited "poem" is a Chinese 詞, composed by 楊慎 (1488-1559) of Ming Dynasty [明楊慎《二十一史》彈詞第三章《說秦漢》], performed in the style of 臨江仙. Some of us have wondered about whatever happened to the Japanese residents of Danshui after they were sent back to Japan in 1946. After all, in the immediate post-war era, Japan was not a good place to start/re-start a new life. It turns out that they did in fact overcome much hardship and more than 300 of them have organized a 淡水会 (Danshui Society) to carry on regular meetings. And always on the agenda is a briefing on the current status of their hometown, Danshui. In Danshui, they were ordinary citizens who sold groceries, wine, salt, stationery, tobacco, and noodles for a living. There were also an artist, a reporter, and a pilot. Some worked at Tansui Jinja, Bank of Taiwan, the Tansui Beach, and the Public Hall. There were also a few administrators including mayors and policemen. 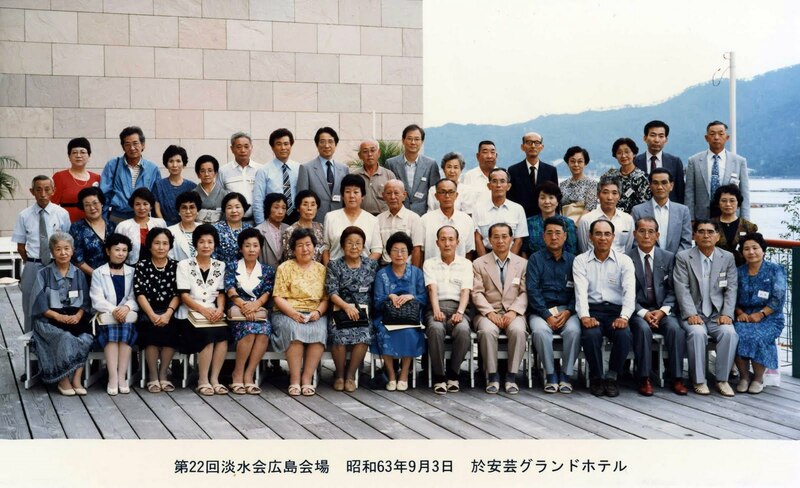 The most influential group was arguably the elementary school teachers who had taught a whole generation of 淡水人 Tansui-jin to be good citizens. Many pupils now in their 70s and 80s, when asked, can still recall the dedication of this special group of educators. Some even remember their Japanese friends and neighbors by name. All from more than 65 years ago. In fact, three generations of Japanese had lived and prospered as 淡水人, and yet all are now almost forgotten as if they had never come and stayed. The memories of the Japanese era remain largely fragmented in Danshui only to survive intact in a foreign land. We wish the current members of 淡水会 well and hope to see Tansui-kai continue and expand with new members from both Taiwan and Japan.